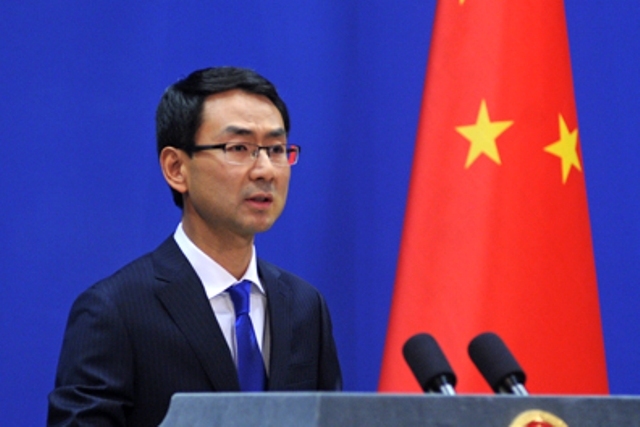 China’s Foreign Ministry spokesman Geng Shuang. (TibetanReview.net, Oct03, 2016) – China has again sabotage India’s move to bring UN sanctions on a Pakistan-based terrorist mastermind responsible for a series of cross border attacks since 2008. “The technical hold on India’s listing application submitted to the 1267 committee in March, 2016 has already been extended,” India’s PTI news agency Oct 1 quoted China’s Foreign Ministry spokesman Geng Shuang as saying. The terror mastermind, Masood Azhar, heads Jaish-e-Mohammad (JeM), which has since 2001 been designated by the world body as a terrorist group with ties to the Al-Qaida. The group is responsible for the 26/11 Mumbai attacks of 2008, the Indian Parliament attack in 2001, as well as the more recent Pathankot attack of Jan 2, 2016. Earlier On Mar 31 this year, China, a veto-wielding permanent member of the UN Security Council, blocked India’s move to bring UN sanctions on Azhar under the Sanctions Committee of the Council. This was to lapse on Oct 3. China was the only member in the 15-nation UN organ to put a hold on India’s application with all other 14 members of the Council supporting New Delhi’s bid to place Azhar on the 1267 sanctions list that would subject him to an assets freeze and travel ban, noted the PTI report. China’s objection means that the terror mastermind is safe from UN sanctions for another six months and a big relief for his sponsors, China’s all-weather friend Pakistan. The extension of China’s so-called technical hold on UN action on Azhar has come in the midst of India-Pakistan tension over the Uri terrorist attack in Kashmir on Sep 18, which has again been seen as having been carried out by the Jaish-e-Mohammad. Ironically, the Chinese action also came after India’s Joint Intelligence Committee chairman RN Ravi visited Beijing on Sep 29 and said, according to asianage.com Oct 2, that there was consensus between India and China that terrorism was a common enemy of the global community and strengthened counterterrorism cooperation between China and India was conducive to the interests of the people of both countries. The Azhar issue has been going on at least since 2009, when China and also the UK put technical hold on the listing. In July, Chinese Foreign Minister Wang Yi had counselled India during a visit to New Delhi that it engage in “friendly consultations” with Pakistan — without naming the country — and arrive at a mutually acceptable solution. And earlier, in April, India had said it found it “incomprehensible” that while the Pakistan-based JeM was listed in the UNSC Committee as far back as 2001 for its terror activities and links to the al-Qaeda, the designation of the group’s main leader, financier and motivator has been put on technical hold. The issue is seen as being likely to be taken up by Indian Prime Minister Narendra Modi when he meets Chinese President Xi Jinping in mid-October, on the sidelines of the BRICS summit in Goa.